He has saved and redeemed us. and given the promise of eternal life. A VERY HAPPY AND BLESSED EASTER SEASON! BE OVERFLOWING UPON YOU ALWAYS. 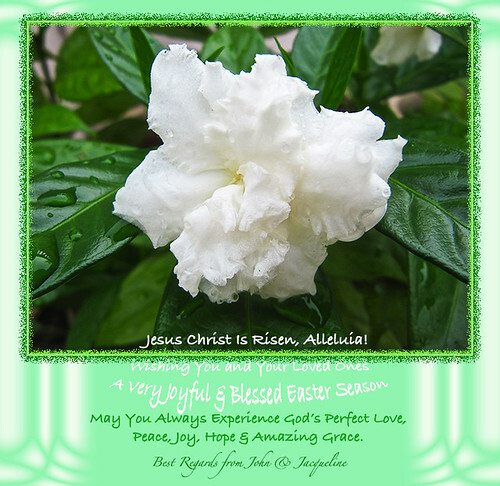 A self-created Easter greeting card with the image of Tabernaemontana divaricata cv. Flore Pleno, from our tropical garden. Thanks for your good wishes for Easter. Glory to our Lord Jesus Christ is risen. Thanks for the beautiful flower, Jaqueline God bless you always. Thanks and God bless you too, dear friend. Have a wonderful weekend.